The Mexican Coronado Islands offer great diving for all experience levels. 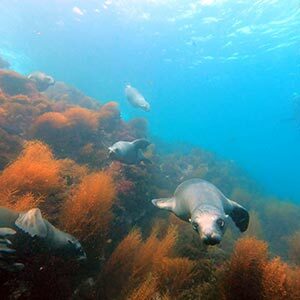 The islands are home to an abundance of marine life including sea lions, harbor seals, horn sharks, and eels. 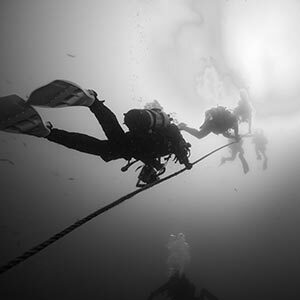 Dive conditions tend to be better than local San Diego. Join us for a day trip to Mexico and be back home in time for dinner! The HMCS Yukon is a 366ft Canadian destroyer sunk off the coast of San Diego in 2000. It’s the most accessible and intact wreck found on the California coast and it's located only 15 minutes away from our shop! 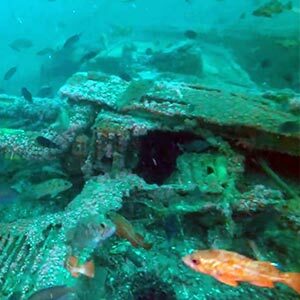 Lying between 70ft and 100ft underwater, the wreck harbors loads of marine life, swim-throughs, and penetration opportunity. The NOSC Tower (Naval Ocean Systems Center) was a research installation located off Mission Bay until 1988, when a large storm toppled the structure. Now it sits in about 55ft under the water with some of the structure coming up to about 30ft. Divers compare this site to a “Jungle Gym” or a small oil rig. Marine life is clustered all over and is not uncommon to see black sea bass on this site. 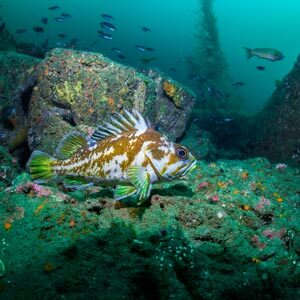 God’s Rock, Quast Rock, and T- Rock are some of the few pinnacle dive sites located on the northwest corner of La Jolla’s headland. 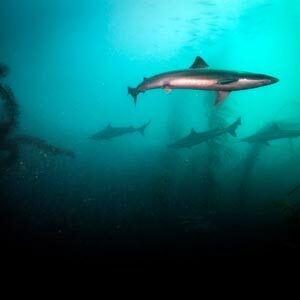 Due to their close proximity to La Jolla Canyon, they offer fun diving and some pelagic encounters. Not uncommon to see a black sea bass or two out here. Depths range between 50ft and 75ft. The P38 aircraft went down in 1943, and sits in 130ft of water right off Torrey Pines. The wreck is mostly intact and lays in the sand. 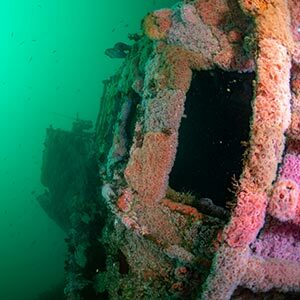 70+ years underwater has corroded away some of the components but the aluminum shell and plexiglass cockpit remain intact. 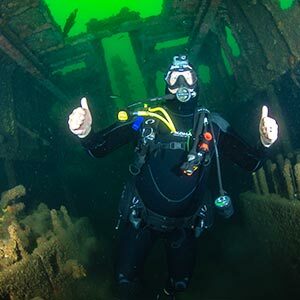 On a clear day, expect great photo opportunities with big fish and fellow divers patrolling the historic plane wreck. 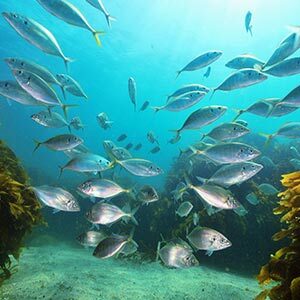 The headland of Point Loma is home to many notable dive sites along the 6 miles of coastline. 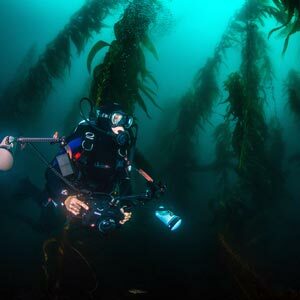 Big boulders, overhangs, scattered walls, and luscious kelp forests are shelter to a diversity of marine life. Spot specific trips are hard to pin down due to dive conditions and other boat traffic - that’s why we keep it restricted to ‘shallow’ or ‘deep’. Notable spots include New Hope Rock, Three Fingers, Main Wall, Dyno Head, Lazy Daze, NRAD, and North/South Pipe. The Ruby E. is a 166ft Coast Guard cutter sunk in 1988, lying upright in about 80ft underwater. The wreck is very weathered and has seen some collapse in its structure. It is common to see schooling half-moons and blacksmiths over the strawberry anemones covered structures. Swim-throughs and penetration are not advised. Scripps Canyon is a submarine canyon located north of the Scripps Pier in La Jolla, right offshore the famous surf break of Blacks Beach. The canyon starts around 75ft and goes deeper from there, well beyond recreational scuba diving limits. This site offers great wall diving, so good buoyancy control is a must. Some highlighted marine life in this area include swell sharks and vermillion rockfish. This dive site is named after its random sets of Train Wheels lying around the vicinity of the site. The area is composed of 3 reefs with big walls and overhangs. The bottom of sand is about 100ft deep and the top of the reefs reach about 60ft. There is a swim-through located in the back one of the caverns wide enough for divers to penetrate one at a time. The USS Hogan lies in about 130ft of water right on the US-Mexico border. 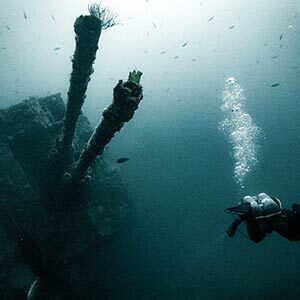 At 314ft long, the ship was a destroyer decommissioned after WWII and used as a bombing target, which led to her sinking and new life as a dive site. Due to the depth, current, and unpredictable visibility, this site is for very experienced and tech divers only.